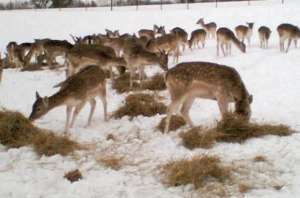 Our herd of Fallow deer grazes with the poultry on 25 acres of organic pasture. We are licensed by the Soil Association to produce organic venison. We only kill our deer in season, but we may have frozen venison at other times. Please contact us for details. You can purchase our venison hung "in the skin" or fully butchered and packed. Fawns are born in May or June but we often miss seeing them hiding in the long grass. In the winter the herds' grazing is supplemented with our home grown organic oats and hay. We have a "hands off" handling policy, the deer are wild. They stay outside year round. They are slaughtered and hung for 2 to 3 weeks. We may be able to offer fresh saddle and haunch roasts for Christmas/New Year. We can supply organic venison boxes (a mixture of roasts, casserole, steaks and mince), butchered, vacuum packed and labelled for the freezer. Contents may differ from those in the picture - half venison box shown. 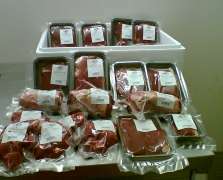 Organic Venison Boxes comprise: Joints, steaks, casserole and mince.